4th of July digital stickers, cupcake toppers, printable party decorations. 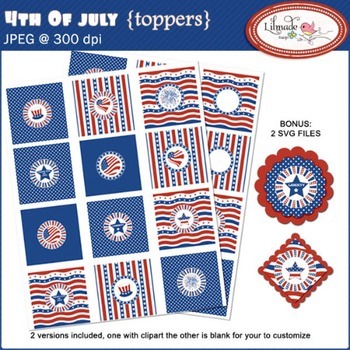 4th of July digital stickers, cupcake toppers, printable party decorations set comes with two sets of Independence Day inspired digital printable cupcake toppers. BONUS: one scallop circle SVG digital die cut, and one scallop square SVG digital die cut. To cut these files you will need to have a die cutting machine such as Cricut or Silhouette Cameo enabled to handle SVG files.